The Nerve Curve is the emotional rollercoaster ride that everyone who engages in Improvement Science needs to become confident to step onto. Just like a theme park ride it has ups and downs, twists and turns, surprises and challenges, an element of danger and a splash of excitement. If it did not have all of those components then it would not be fun and there would be no queues of people wanting to ride, again and again. And the reason that theme parks are so successful is because their rides have been very carefully designed – to be challenging, exciting, fun and safe – all at the same time. So when we challenge others to step aboard our Improvement Science Nerve Curve then we need to ensure that our ride is safe – and to do that we need to understand where the dangers lurk, to actively point them out and then to avoid them. A big danger hides right at the start. To get aboard the Nerve Curve we have to ask questions that expose the elephant-in-the-room issues. Everyone knows they are there – but no one wants to talk about them – and the biggest one is called Distrust – which is wrapped up in all sorts of different ways but inside is the Kernel of Cynicism. The inexperienced improvement faciliator may blunder straight into this trap just by using one small word … the word “Why”? Arrrrrgh. Splat! Game Over. Next. The “Why” question is like throwing a match into a barrel of emotional gunpowder – because it is interpreted as “What is your purpose?” and in a low-trust climate no one will want to reveal what their real purpose or intention is – they have learned from experience to hold their cards close to their chest – it is safer to keep their agendas hidden. A much safer question is “What?” What are the facts? What are the feelings? What are the effects? What are the causes? What works well? What does not? What we we want? What don’t we want? What are our options? What would each deliver? What are everyones’ views? What is our decision? What is our action? Sticking to the What question helps to avoid everyone diving for the Political Panic Button and pulling the Emotional Emergency Brake before we have even got started. The first part of the ride is the “Awful Reality Slope” that swoops us down into “Painful Awareness Canyon” the emotional low-point of the ride – where the elephants-in-the-room roam for all to see and where people realise that once they are in view there is no way back. The next danger is at the far end of the Canyon and is called the Black Chasm of Ignorance and the rollercoaster track goes right to the edge. Arrrgh – there is no way back now – we are going over the edge – quick grab the Denial Bag from under the seat, apply the Blunder Onwards Blind Fold or the Hope-for-the-best Smoke Hood. So before our carriage reaches the Black Chasm we need to switch on the headlights to reveal the Bridge of How: the structure and the path to the other side and copiously illuminated with stories from those who have gone before. The track is steep though and the climb is hard work. Our carriage clanks and groans and it seems to take forever but at the top we are rewarded by a New Perspective and the exhilarating ride down into the Plateau of Understanding where we stop to celebrate our success. Here we disembark and discover the Forest of Opportunity which conceals many more Nerve Curves going off in all directions – rides that we can board when we feel ready for a new challenge. There is danger lurking here too though – through the Forest is Complacency Swamp – which looks innocent except that the Bridge of How is hidden from view. Here we can get lured by the sweet smell of Power and the addictive aroma of Arrogance and we can become too comfortable in the Hammock of Blissful Ignorance where we do not notice that the world around us is changing. In reality we are slipping backwards but we do not notice – until we suddenly find ourselves in an unfamiliar Canyon of Painful Awareness. Ouch! Being forewarned is our best defence and while we are encouraged to explore the Forest of Opportunity – we learn that we must return regularly to the Plateau to don the Role of Educator and to refresh ourselves from the Fountain of New Knowledge by showing others what we have learned and learning from them in return. And when we start to crave more excitement we can board another Nerve Curve to a higher Plateau of Understanding. 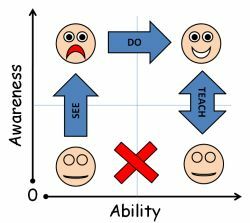 The Safety Harness of our Improvement journey is called See-Do-Teach and the most important part is Teach. Our educators need to have more than just a knowledge of how to do, they also need to have enough understanding to be able to explain why to do. To convince others to get onboard the Nerve Curve they must be able to explain why the issues still exist and why the current methods are not sufficient. Those who have been through the ride are the only ones who are credible because they understand. And that understanding grows with practice and it grows quickly when we take on the challenge of learning how to explain the why. This is Nerve Curve II. All aboard for the greatest ride of all.